So far I’m 2 for 2 in the “going overboard” department when it comes to Kate’s birthday parties. I always do a little more than I had originally intended, and spend a little more than I had originally planned. I can’t help it! To me it’s worth it, and I don’t see that changing anytime soon. After Kate’s parties, I’m always so sad to take her decorations down and return to life as usual. I decided to keep at least some of the party going after her first birthday by reusing a few of her party decorations in her nursery. It was a great way to get even more out of the work I put into them, and I love having a daily reminder of her fun day. I love it so much, in fact, that I’ve decided to do the same with her second birthday party! For Kate’s 2nd birthday we had a Sesame Street-themed party, which was a huge hit. 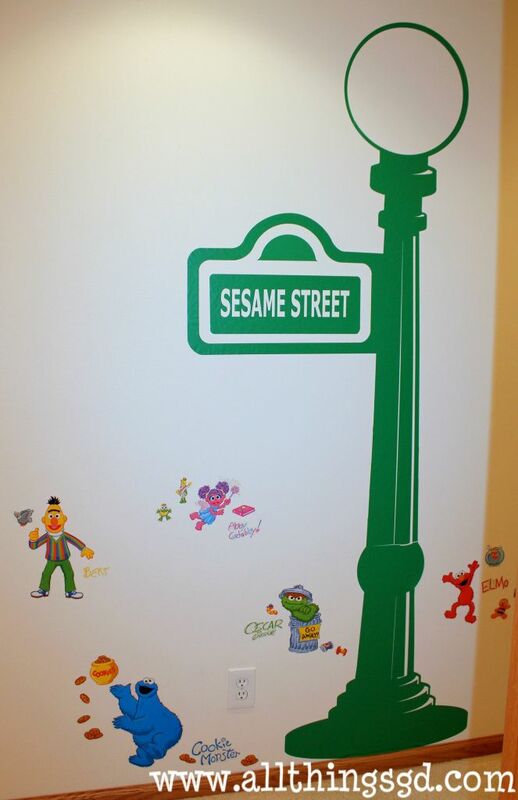 One of Kate’s favorite decorations (other than the hundreds of balloons, of course) was the life-sized Sesame Street lamp post wall decal I custom ordered from Modern Wall Graphics, and matching Sesame Street character wall decals I found at Target. 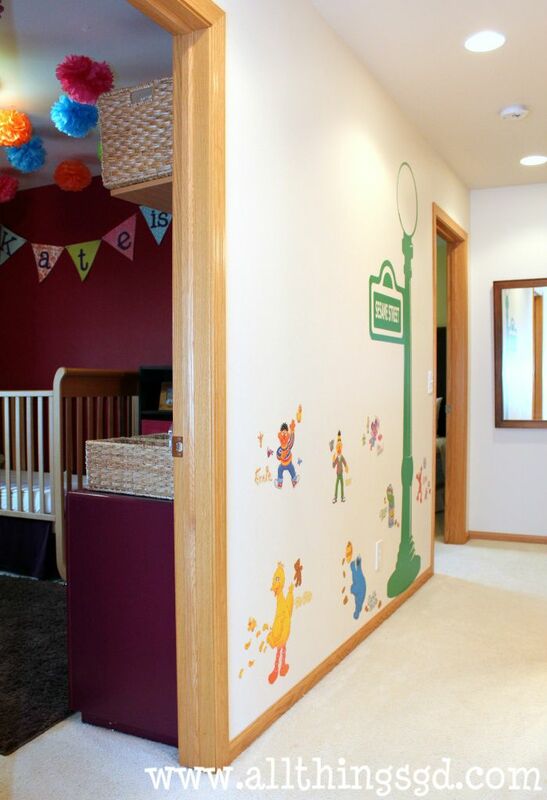 They lined our entryway for weeks after her party was over–and now they have a permanent spot in our upstairs hallway! Our plain and boring upstairs hallway is now fun and colorful with all of Kate’s favorite characters lining the wall, right at her eye-level. I love having yet another daily reminder of Kate’s special day! I would have fun in that hallway! Love it! So cute Dusty! What a great idea putting them in tbe hallway. What a great idea for re-use and fun! Hi there. 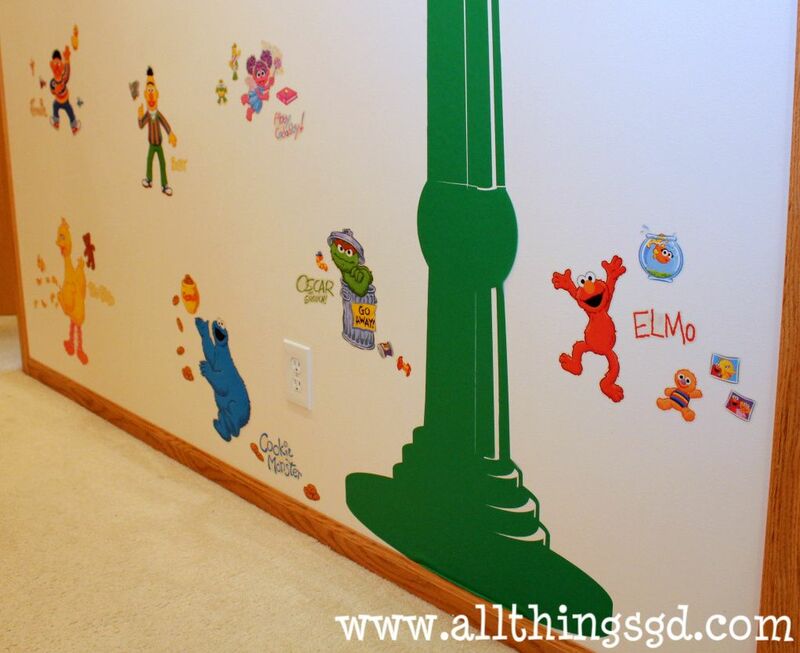 I’m doing a Sesame Street theme this march and I just bought the same light post wall decal. Love that idea. Thanks. My question is was it difficult to peal and stick in your upstairs hallway. I hope to do the same since it’s pretty pricy. Thanks.